The news have reported that the current White House administration instructed the Centers for Disease Control (CDC) from using seven words on their budget documents. With seven days left for Christmas, I decided to take the time to write a piece each day highlighting one of the seven words. In the Christian tradition there is the sharing of the Seven Words. These are phrases that Jesus shared while being crucified. Many Christian churches share and preach on these Seven Words during their Good Friday liturgies. The Seven Words are the climax of what Christian theology calls “the story of salvation.” The last words that Jesus shares are: “it is finished” (John 19.30) and “into your hands I commend my spirit” (Luke 23.46.) After these words, Jesus expires. According to the timeline of events, after Jesus expires on the cross he is placed into the tomb and on the third day he is resurrected. This is the hope of the Christian person: no matter how difficult the journey is, no matter how painful the culmination of life is, there is always the hope of resurrection. This is the message of Holy Week. Why am I writing about Holy Week on the season of Advent leading into Christmas? Because the Seven Banned Words of the CDC are a mirror of those other Seven Words of Holy Week. The current federal administration has been crucifying the remnants of the facsimile of democracy that the United States had. With each carefully orchestrated move, the current administration tries to diminish the people’s confidence and trust on institutions serve the country. They are intentional in the use of words to describe the institutions that keep some resemblance of democracy. The administration’s furious attack on the free press, their obsession with political rallies a year after elections, their systemic appointment of people completely unprepared and unqualified to lead the agencies they are appointed to oversee, their deliberate construction of lies disguised as truth, the unashamed use of FOX News as state propaganda television, and a myriad other big and small actions that undermine democratic processes are just the tip of the iceberg. The United States democracy is being crucified. Although Auguste Comte’s positivist approach to explaining society is not ideal, it does have merit, especially taking into consideration the banning of words in certain official documents by the current administration. A positivist society understands that humanity is on a journey forward. This journey cannot be contained, no matter how much the powers that be may try to stop it. Resurrection is the conclusion to the crucifixion. Progress is the conclusion to temporary repression. Democracies are vulnerable entities. They can suffer from the ego of leaders who place power over service. Interestingly, Christmas is the time of vulnerability. In the Christian tradition, Christmas commemorates the birth of a vulnerable child, from a vulnerable family, who was threatened, even as a fetus, with destruction by its enemies – political, economic, societal, cultural, and religious, among others. Christianity proclaims that this child that was born transcended what humanity understood at that moment about the relationship between humanity and its divine sovereign. Some theologians propose that this transcending experience of God made Sophia, the common image of God as Wisdom, take the form of Christ in the person of Jesus, thus making God a transgender reality showing humanity how close the Divinity is to all of humanity. The diversity of opinions that ages of science-based social studies and evidence-based conclusions have shown us, is evidence that societies do tend to move forward towards progress and positivism. It is our responsibility, our duty, and even out entitlement as engaged members of a functional society, to be in solidarity with the vulnerable democracy that we are so desperately trying to save. Resurrection is the conclusion of crucifixion, even during the time of Advent and Christmas. The last time I was in church was for the installation service of a close friend. I attended because she invited me to preach and that was a huge honor. The last time I attended church before that was the Sunday after election in the USA. Having been raised in the Church, I often relied on this community to be the safe space where I could bring my fears into with the hopes of being healed. When Republican Party enthusiasts, emboldened by the rhetoric of President Trump and Republican leaders in the USA Congress, led a group of white supremacists, Nazis, and Ku Klux Klan sympathizers to march on the streets of a public university in Virginia, I felt the need to return to Church. I woke up on Sunday with the idea of finding a nearby congregation to attend. Somehow, I had equated church with healing and community and restoration. But then, I started to doubt it. I stopped to think about what Church had really been for me. All throughout my life, Church had not been a welcoming, healing, restoring community. On the contrary: Church was the people marching on the campus of the University of Virginia with torches, threatening many of my communities with violence and death. Since my childhood time in Church, I had only heard hatred and violence against “sinners.” The goal was to rid the World from the sinful; to establish God’s kingdom, where the violent will reign with Christ and the Earth would be transformed into their playground. The images of fire and destruction were the ones used to exemplify this future. The King will stand to divide the crown and send some – the goats – to the pits of hell to rot for eternity, with pain and punishment unimaginable. Others – the sheep – will be lifted up to heaven to be with their Ruler. I have been in several churches throughout my life, both as a parishioner and as a pastor. Every church has been different: my rural Baptist church in Puerto Rico, the underground Metropolitan Community Church also in Puerto Rico which I led for a few months before going to seminary, the urban, large Baptist church that sent me off to seminary, the suburban, white, moderate Baptist church that ordained me, the small, urban Hispanic Baptist church in New York City that welcomed me as their pastor, the multicultural, urban Methodist church also in NYC that provided refuge and welcomed me as a leader, the urban, liberal, white church in Seattle that made me question my call to ministry and which proved me that liberal churches are no safer than conservative ones, and the little suburban Episcopal church in Wisconsin with a worship service in Spanish that offered a few months of refuge while I served other ministries. Church was the place where my first conversion therapy sessions happened. It was the place where I was made ashamed of my sexuality. It was the place where I learned to be secretive and embarrassed about liking men. It was the place where people gossiped about their neighbors throughout the week while coming to pray together on Sunday. Church was the place where I had to hide my sexuality even as I was both on the ordination process and as I served as a pastor. It was the place where I was asked not to be creative with liturgy as this was not welcomed. Such experience was once again relived as I was invited to write for a white denomination’s worship resources and my work was deemed too “intimidating” because it didn’t fall within the liturgical styles of the white church. Both homophobia and white supremacy were present this weekend in Virginia. Both homophobia and white supremacy were present in this church experience for me. Church was also the place where the white visitor who saw me walking down from my office responded to my greeting by saying “Are you the janitor?” No, I was not. I was the preacher that day, and perhaps that’s why you didn’t come back? Church was the place where, behind closed doors and without ever telling me, the congregation had the excellent idea of paying for speech classes for me to become a better speaker of English… instead of learning how to accommodate their ears to a different accent. But that’s OK for them, because they are “liberal” and they “get it.” They too were present at the demonstrations in Virginia. Church was the place where the fragility of the person who bullied me was most important than my safety. It was the place where I approached with caution because each time I pulled over to the parking lot, my hands started to shake and my heart started to race as the bully’s car was parked there too. It was the place where her dismissal of my leadership was encouraged; the place where they welcomed meetings with her behind my back to talk about the supposedly weak pastoral care I was providing the congregation, without ever knowing that I was often visiting, listening, calling, and praying with the elders who had asked me point blank to please keep this woman away from our household because they were afraid of her too… But I could not tell her that without facing the doubtful stares of cheering crowd. Church was the place that didn’t allow me to fall asleep from Friday night to Sunday night just because of the fear I had of coming to worship on Sundays. Even after trying different prescriptions – yes, prescriptions from my doctor – and relaxation methods, I could not do it. The bullying was that strong, and the lack of support was too much. This white fragility that didn’t allow this bully to recognize the leadership of a Latino man in church also marched in Virginia this weekend. Church was the place where the priest addressed the violent rhetoric of the election season and the overwhelming support of white supremacists for President-elect Trump by calling the small group of Latino and Latina people by asking us… us… to come together with our oppressors and to find unity. This was the last drop. I had tried long enough to make the Church a place of respite and community. The Church has not been such a thing for me. I need to break from this abusive relationship for good. Church, you are not safe for me as long as you march with torches and hatred. Perhaps Church has been different for you, and for that, I am glad. Perhaps you will send a few words of “encouragement” and some apology on behalf of the Church. Don’t. I do not need them, nor do I need to explain more than I had already expressed here. Theology as a discipline and a field of study will continue to be a passion for me. The Church as a place for community, on the other hand, will not. However, I did see some glimpses of hope for the future. Sure, there is no way of knowing how many of us will survive the regime. And certainly, we can’t even say for sure whether the authoritarian democratically elected will actually follow the Constitution and rule for only the allotted time. But, for whatever time we might need to suffer this regime, the signs of a hopeful future are out there. As I was talking a walk around the campus of the university near my office, I saw many messages of hope, acceptance, and support for minorities. This gave me some hope that many young people do understand the significance of this historical time. Perhaps the older generation are so fed up with democracy that they did not care about using their democratic rights to bring an authoritarian into power, but the next generations DO care about democracy and pluralism. The resistance has continued to grow, and just like in previous authoritarian regimes, this time there will be martyrs and victors. Sure, the democracy of the USA has come to an end for the time being, but out of this coming regime a “more perfect union” will arise… Our youth are leading the way! I have no more tears today. I have cried since last night. I have cried for the future of my family. I have cried over the prospect of having a Supreme Court that will undo my marriage, and with it, all the protections that my immigrant spouse has. I have cried for the well-being of my niece and nephew whose parents might be taken away from them. I have cried for my other relatives who live and work and contribute to the economy of this country while not being able to access proper documentation. I have cried for the prospect of my own, Congress-imposed US citizenship been revoked with no other alternative to fall back on. I have cried for my friends. I have cried for my gay, lesbian and bisexual friends whose rights are now at the hands of vice-president elect Pence, who has done all in his power to strip LGB Indianans of their rights. I have cried for my transgender siblings whose lives are placed in great danger due to the same vice-president elect and his antics. I have cried for the many women I know – young and old – whose safety is not guaranteed anymore as a sexual predator takes over the highest elected position in this country, thus giving permission to other predators to “grab”, to touch, to violate their beings. I have cried for the workers of this country, whose wages are going to be frozen for decades to come and whose jobs are not guaranteed anymore as they are being shipped overseas as the president-elect has done with all the other bankrupt businesses he has run. I have cried for the poor and sick who could barely access healthcare and had a last fighting chance with the soon-to-be-overthrown Affordable Care Act. I have cried for humanity. I have cried for the black community whose safety – which has never been guaranteed – will now face “stop and frisk” experiences with the proposed changes in law and order. I have cried for the Native American communities whose ancestral lands will be desecrated without impunity. I have cried with the immigrants and refugees who will no longer find relative safety in this country nor will they be welcomed to access it anymore. I have cried with those of us who practice some form of faith – whether Christianity, Judaism, Islam, Hinduism, Sikhism, Buddhism, or any other – whose religious liberties will be at the whim of the far-right Evangelical Christian camp that will dominate this fascist regime. I have cried for the environment and all the relentless desecration that will occur. I have cried for all the people of all the countries that the president-elect has promised to destroy making use of the military forces that are now under his control. I have cried for all the children who will not be safe any longer for a generation or two as laws protecting them will be revoked. I have no more tears today. The only thing that I still hold on to is the hope that the fascist government ahead will help this country wake up from its deep slumber and that it will shake it to its core as to make it see how terrifying the near future looks like. On November 20th, President Obama announced executive actions regarding immigration. The provision has been called “the right thing to do”, “timely” and even “bold” by individuals and organizations that portray themselves a progressive. The reality, however, is different. The recent executive action is not even close to the comprehensive reform that is sorely needed by the immigrant communities in the United States. Certainly is not timely, as the President had the chance to act on comprehensive reform when he promised, immediately after his reelection in 2012. Finally, the recent executive action is far from being bold; the action is timid and weak. According to some experts, about 5 million immigrants will benefit from the executive action. The program has five main focus areas: expansion of the previous Deferred Action Program (DACA) for DREAMERS, allow parents of US citizens to stay in the country for up to three years without fear of deportation, expanding the waiver program that was already in place for unlawful residents, modernizing and clarifying immigrant programs, and promoting citizenship education. Of these areas, two are the most contentious: the expand of the Deferred Action and allowing parents of US citizens to stay in the country for up to three years with a provisional work permit. These actions, while might look like a dim light at the end of a very dark tunnel, need to be taken very seriously and with a grain of salt. Why? These programs are creating large, federal databases with enough information on undocumented residents which can be easily accessed by future administrations that might not be fond of immigrants. Currently, and up to the Election Day on 2016, there is a 50/50 chance of a Republican takeover of the White House. If the Republican candidate runs on the same platform that the party has espoused so far, this means that 5 million undocumented residents will be at the will of a hostile president who might take action in deporting them. We must remember that Obama’s executive action has a three year lifespan. This is well into the administration of the next US President, whoever that person might be. Moreover, the executive action affects less than half of the total undocumented immigrant community. During a conversation with my spouse, who has lived in the USA without documentation for the past 11 years, we wondered what was going to happen to most of our family. Would they be able to apply for the executive action? What about our friends? The answers were not what we needed or wanted to hear. Only one member of our family, whose son is a US citizen, will qualify for this executive action. Others, such as an uncle who has lived in this country, paid local and federal taxes, worked and invest in the local economy for the past 12 years, would not be able to qualify for the mere reason of not having any children born in the USA. In addition, our friends who are gay or lesbian, who have no children and many of whom never thought of having children, but who have lived in the USA for most of their lives, will not qualify for Obama’s executive action. How can such an action be called “bold”? Indeed, Obama’s executive action on immigration is weak, timid, and comes with too many risks for the undocumented community. It will be extremely important for undocumented residents to explore what options are best for them. Three years of a temporary work permit, with the possibility of deportation at the end of that time, might not be the wisest movement for many undocumented residents. There is one thing, however, that has been made clear throughout this process: Obama and his advisors are good politicians. He decided not to push for comprehensive immigration reform before the mid-term elections, thinking that this would give them advantage with the conservative-leaning undecided voters. Somehow, he and the Democrats took for granted the support of minority voters. That, as we have already seen, backfired. By presenting this weak and timid executive action, he hopes to get back the support of the left-leaning voters while at the same time look like a “champion” of the immigrant communities. Of course, the Republican Congress is going to do everything in their power to minimize the effects of this executive order, which will make them look like “the bad guys”, which is exactly what Obama and his party needed to win the next general election. 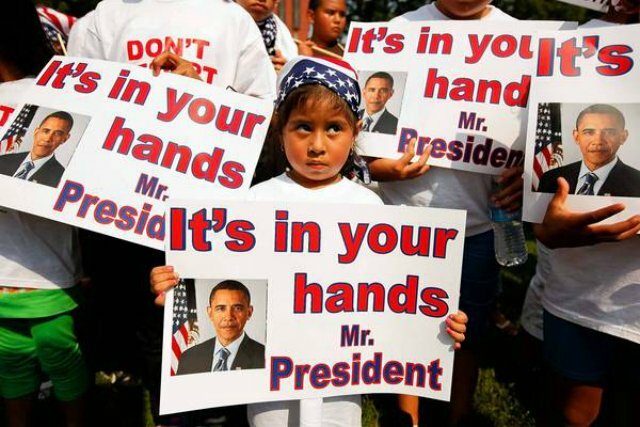 Basically, Obama and the Democrats are using the immigrant community as a weapon in their dirty political game. Add to this what I have already experienced: the resistance of the – mostly white – liberal voters to acknowledge that Messiah Obama cannot do anything wrong. I have already received messages from friends and acquaintances that ask me to stop criticizing the President’s actions lest the “right” use that as a weapon against all the other positive things that President Obama has accomplished. But I cannot keep silent. My role in a semi-democratic society like ours is to raise my voice when I see unjust actions that affect those who have no voice within the political structures. The role of any citizen is to keep their government checked lest it lose sight of its responsibility: to look after the wellbeing of all of the people. Just because President Obama has accomplished many great things during his tenure does not mean that I need to stay silent when he does wrong. On the contrary, it is my civil responsibility to call on the government officials who represent me to act according to what is the wellbeing of all my fellow citizens. Finally, with the reaction I have seen from the – mostly non-immigrant, and mostly white – liberal community, it is my fear that pressure on the Obama administration to proceed with comprehensive immigration reform might wane. It seems to me like the progressive voice has, once again, fall trapped of the “Obama charisma and speech” and is willing to compromise the lives of the other 6+ million undocumented residents who will not qualify for this executive action. If the progressive voice is not heard anymore, neither Democrats nor Republicans will feel the need to move boldly on immigration reform. We have already seen how every progressive voice has been praising Obama for his weak and timid action, calling it “bold” when in reality is not even close to be so. I do not want to be the kind of citizen that serves as a rubberstamp for the political leaders I do support. What I want to be is a responsible citizen who is willing to criticize the wrong actions of any political leader, even if I agree with them in most of the policies that they support. Mr. President, we need you to take BOLD action on immigration reform. Mr. President, we need you to ACT on immigration reform and not just use our immigrant communities as political weapons. Mr. President, we need you to BE A LEADER and not just a politician. The lives of over 11 million people who live and contribute to this country depend on you.